The national currency of Latvia - Lat (1 LVL = 100 santims). International designation of Lat - LVL (inside Latvia - Ls). Lat's exchange rate to the euro is constant - 1 EUR = 0,702804 LVL (or 1 LVL = 1,423 EUR) for usage euro in Latvia in future. The Bank of Latvia allows to vary the rate of the lat in the FOREX to within 1% of the value of the euro. Exchange rates of other currencies (dollar, pounds, krone, frank ...) to lat are changing depending on exchange course these currencies against the euro. Money Exchange - Any currencies to lats and back - free and everywhere - currency (euro, dollars, pounds, krones, etc.) can be exchanged in banks, exchange offices, airport Riga, hotels. The exchange rate is different everywhere. The amount of money for exchange is not limited. Money Exchange in Latvia you may do without presenting any documents. In case of exchange amount over 5000 lats (more 7100 euros), you will be asked to show passport or other ID. 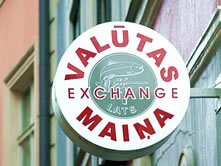 "Valutas Maina" - Currency exchange in latvian language. Money change offices are everywhere - on streets, railway stations, airport, post offices, sea port - and open seven days a week. Currencies exchange rates in Riga - may be various. You can change money in latvia banks, but the exchange rate will be worse than the best rates in exchange offices of Riga, except airport. Banks are open weekdays from 9:00 to 17:00. Seven days a week and till 21:00 open banks that are located in all shopping centers, airport. You can change any currency - euros, dollars, pounds, russian ruble, krona, litas, hryvnia. Best money exchange offices in Riga (for example, "Marika") offer the best and profitable currency exchange rates in Riga, located in city center - on the Merkela street (opposite Central Station) and the exchange rate shown in the table of currency convertor rates for lat. These exchange rates will help you decide which currency you'd better take to Latvia (euros, dollars, rubles, pounds, krones), because the exchange rate of any currency (euro, dollars, rubles, pounds, kronas) to local latvia money (lats) in Riga and Jurmala will be much better than in your city in England, Germany, Sweden, Finland, Norway or in any another country. Exchange offices in Jurmala as well as some exchange offices in Riga set up multiple exchange rates for currencies, and the rate depends on the amount of exchange money. Just not to be cheated or not to be misunderstood with mistaken currency exchange rate in Jurmala - first of all find out the exchange rate for your amount - ask the cashier in exchange office. You may also change money in latvian banks. When you exchange money in bank in Latvia - you have to pay the bank charges (about 50 sant.). Currency exchange offices in Jurmala located along the Jomas street. Some bank's branches are also located on Jomas street GE Money (address: Jomas 59) and Latvijas Krajbanka (Jomas 37). Next to MAJORI there are branches of banks Citadele (Jomas 1), Swedbank (Dubultu pr. 3), SEB (Dubultu pr. 19). The exchange rate for lats in Latvia is much cheaper than abroad. That's why to change euros, dollars, pounds, rubles, krones for lats and back - it's better in Latvia. The profitable and the best exchange rate for currencies to lats definitely in Latvia. FOREX - Exchange rate euro for lat is constant and Bank of Latvia allows to vary the rate of lat (local latvian money) in the FOREX within 1% of the value of euro. Exchange rates of other currencies - dollar, pounds, krone, franc - to lat are changing depend on exchange course these currencies against euro. Lat's rate changes to other currencies together with changes euro in market FOREX. Forex (or FX) - the interbank foreign exchange market for free prices. The Forex market (FX-market) is used for mutual exchange quote. Forex trading (FOREX) - currency market and currency trading - is used for speculative currency trading using leverage, margin trading currency. Latvian lat rate in relation to global currencies (Euro Pound Ruble Franc Yen Krona) in the FOREX see in the table. LAT - Foreign currency exchange rate in Riga, Latvia is more profitable than in England, Finland, Norway, USA, Germany, Sweden, Poland, Estonia, Lietuva, Moscow, St. Petersburg, Russia, Belarus, Ukraine, Kiev and change other foreign currency - euro, dollars, pounds, franc, yen, rubles, hryvnia, krones, lits for Latvian lats - more comfortable in Riga, Latvia. Latvian exchange rate allows to best change foreign money with profit here in Latvia. See the table of exchange rates in Marika and Tavex Money Converter (Dollars Euro Pound hryvna) as best exchange rates for lats in Riga, Latvia on this page. Network of exchange currency offices (euro, dollars, pounds for lats) is widely spread in all cities of Latvia and you can change any foreign currency - rubles, hryvna, shekel, euro, dollar, pound, krona - and any amount of money - the best exchange rate in Riga Latvia. It's more profitable to change foreign currencies for latvian money lats (LVL) in Riga Latvia.